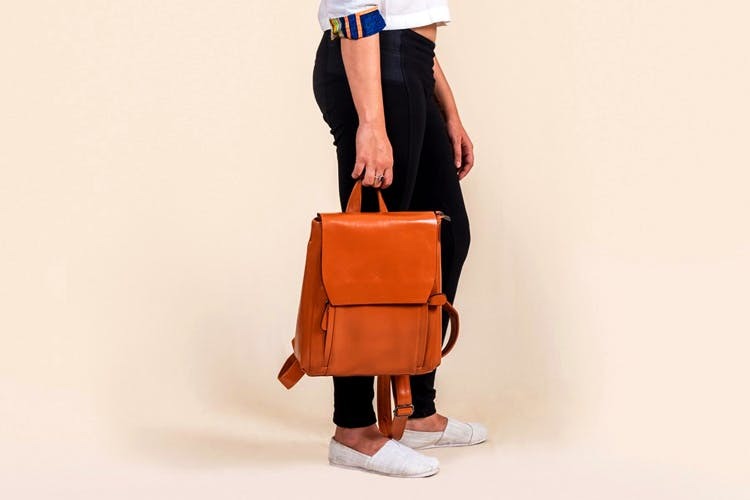 27 is an online shopping portal that makes backpacks, slings, totes and laptop sleeves with vegan leather – for anyone looking to buy leather lookalikes minus the exorbitant prices and animal-lover guilt. Twenty Seven was envisioned by Aditya Abhyankar and Joydeep Singh to offer new designs and bags that feel and look like leather bags abut are not pure leather. This scores the point for the socially conscious eco-warriors looking for a bag as long lasting as the leather ones. All of the bags by 27 are made out of vegan leather. For the uninitiated, vegan leather is basically man-made leather, or in simpler terms faux leather. The material for the leather is generally sourced from local markets across the country – from Gujarat, Rajasthan and even Delhi – made from scratch, refraining from using any animal material. Their vegan leather range of city backpacks, sling bags and the totes. They have a chic collection of laptop sleeves as well. Our pick is the mustard city backpack made with vegan leather and nylon linings. Their mini-cross body sling also caught our eye. It’s available in four different colours and is really cute – perfect for a casual day out or can even double up as an office bag. The tote sleeve is another one to watch out for. For men and women alike, anyone can carry the laptop in it and it’ll look fashionable. Apart from the set collection, they are also open to customisation orders. Once the order is placed, it takes approximately 20 days including delivery time to receive the bag – packaged well and made to order. In need of a good bag but don’t want to splurge on an expensive leather bag? Or want your own customised bag? Then 27 should be bookmarked for sending in a customised order.